We bought this house to use as a second home and found that we weren't using it as much as we thought we would. We then decided to share it with others. We had been coming to Whidbey Island for years on vacation before we decided to buy. We hope that you will enjoy our house as much as we do, and you may even find yourself coming back as we and many of our guests have. High bank waterfront, with access to beach in community. 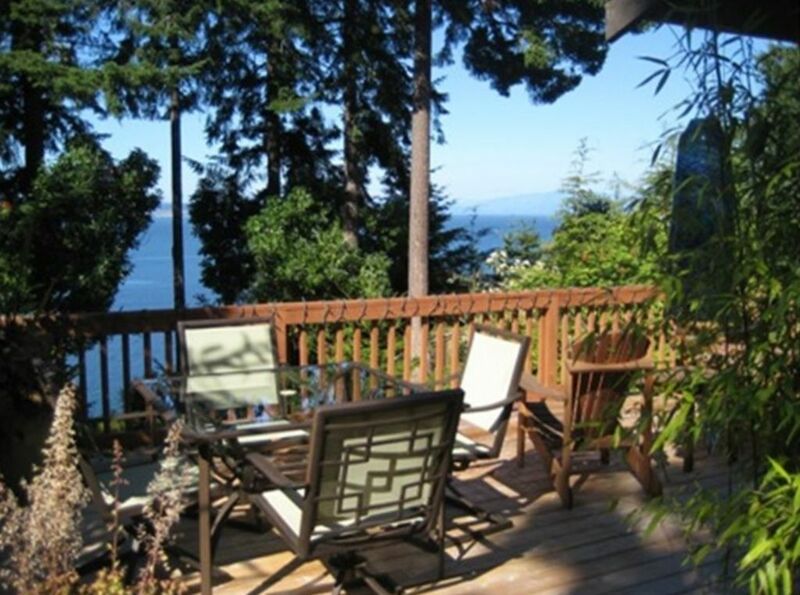 Large deck patio, with beautiful views, perfect for entertaining. We enjoyed our stay at The Happy House! Easy to find..great communication with the owner. The hot tub was amazing! The Happy House comes by its name honestly! Very comfortable with plenty of room for everyone and all the amenities you need. The view and the hot tub were the icing on the cake! This was a perfect launching point for all things Whidbey- we loved how close we were to Coupeville and took advantage of the farmers market, shops and wonderful food (can recommend Christopher's and Caio!). Easy to get to the ferry to walk-on and take a day trip to Pt. Townsend, and also to get to some of the great Whidbey parks (Deception Pass, South Whidbey Park, etc.). Our family loved this home away from home! Thanks, glad you enjoyed the house and the location. We just love the location as well. Come again some time and get 10% off! Nice location, close to wedding that we attended. The stay was nice. I noticed a musty smell downstairs and it wasn’t very clean down there. We ended up vacuuming because there was cobwebs w spider eggs on the stairs and bugs on the carpet. Kind of a bad way to start our stay. The shower also had hair in and around it. Deck was dirty. It’s a nice place but it was missing some of the attendion to detail in the cleaning area. So sorry you had that experience, we work really hard to make sure everyone has a great clean stay. Thanks for your information, we will forward it to the cleaning service. This property has it all: location near the beach and Coupeville. This house has a great layout with many spaces to spread out. Large desk for lounging and cookouts. Hot tub in a secluded back yard. The kitchen is large and well supplied with every appliance and cookware you could need. Our family had a wonderful stay at Happy House. So glad your stay was as expected. We strive to give you the best stay possible. Thanks for the great review, and come again and get 10% off on your stay. Extremely private, peaceful, and restful experience. Very comfortable, clean, quiet, bright home with breathtaking waterfront and Mountain view in backyard. Entire family loved our week-long stay and feels rejuvenated. Truly a very happy home! Thanks again for staying at The Happy House. We are so glad that you had a great experience and look forward to having you again, if you are ever in the area! Receive 10% off on future stays. Perfect bliss tucked away on a hill! Lovely property. The view from the bedrooms, living - kitchen - all encompassing and dreamy. The house sits on a cliff over looking the bay - and we greatly enjoyed just sitting and watching the sun dance on the water, and bald eagles overhead. The house while close in proximity to neighbor's - is extremely private with large trees and green strips blocking view of fellow homes. We felt privately secluded and never even saw another neighbor. Shane is an excellent person to deal with. I find him honest and forthright - and I enjoyed communication and fast emails from him. Speaking of - the wifi at the house is VERY fast - we all appreciated good wifi. Thank you for a great experience and we would be honored to come back!!! No more than 6 guests allowed on property, unless discussed with owner prior to rental.